Spatial data analysis is a fast growing area and Voronoi diagrams provide a means of naturally partitioning space into subregions to facilitate spatial data manipulation, modelling of spatial structures, pattern recognition and locational optimization. With such versatility, the Voronoi diagram and its relative, the Delaunay triangulation, provide valuable tools for the analysis of spatial data. This is a rapidly growing research area and in this fully updated second edition the authors provide an up-to-date and comprehensive unification of all the previous literature on the subject of Voronoi diagrams. A wide range of applications is discussed, enabling this book to serve as an important reference volume on this topic. The text will appeal to students and researchers studying spatial data in a number of areas, in particular, applied probability, computational geometry, and Geographic Information Science (GIS). This book will appeal equally to those whose interests in Voronoi diagrams are theoretical, practical or both. 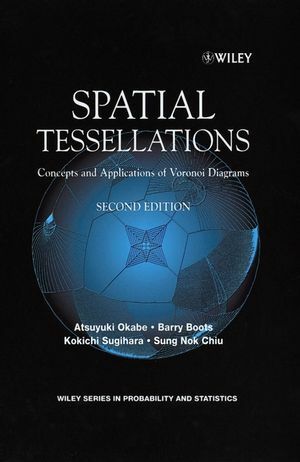 Atsuyuki Okabe is the author of Spatial Tessellations: Concepts and Applications of Voronoi Diagrams, 2nd Edition, published by Wiley. Barry Boots is the author of Spatial Tessellations: Concepts and Applications of Voronoi Diagrams, 2nd Edition, published by Wiley. Definitions and Basic Properties of Voronoi Diagrams. Generalizations of the Voronoi Diagram. Algorithms for Computing Voronoi Diagrams. Locational Optimization Through Voronoi Diagrams.